I was walking down the road, and I saw a donkey... hee-haw! And he only had three legs. 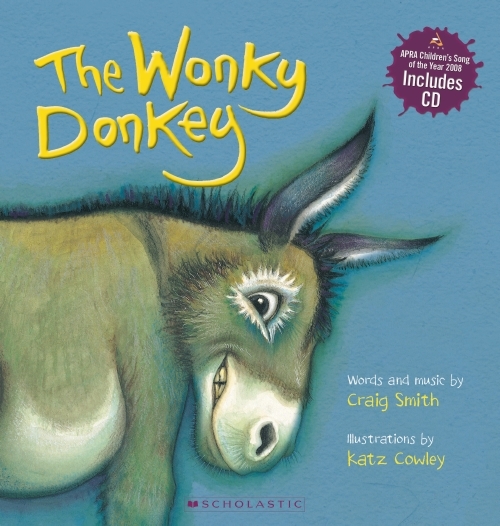 He was a wonky donkey...In this funny, cumulative song, each page tells us something new about the donkey until we end up with a spunky, hanky-panky cranky stinky dinky lanky honky-tonky winky wonky donkey, which will have children in fits of laughter! There is much fun to be had by listening to the song and trying to predict the new word for each clue given! Includes bonus CD performed by Craig Smith. I was born in London, but now I live at a very magical sculpture garden in Australia, where I have been since the February 2011 quake in Christchurch. James Allen's Girls' School, London. I was known by my official name—Katie—at school. My grandparents actually gave me the nickname Katz which means 'little kitten' and I always preferred it to 'Katie' so it’s what everyone knows me as now. The daydreamer at the back of the class doodling! I was the only girl in my year who failed my exams. But I loved drama and art, which I passed with flying colours; and I think the daydreaming was because I preferred to get lost in my imagination. Wrote 'poo fart wee bum' in the condensation in the window with my best friend Rosy Wood. We got sent to the headmistress because she recognised our handwriting. Hard to choose! The Wishing Chair by Enid Blyton holds very magical memories...it’s a book to disappear into, and makes you think about your wishes! I love anything Shaun Tan does. He is an inspirational genius, he’s very clever. Well, I love my avocado and banana smoothies in the morning...they are green, like my favourite colour! Mirror Mask is a movie crammed full with creatively juicy characters and ideas and The Lost Thing by Shaun Tan is a bite-size stroke of genius—it may be short but you can watch it over and over and see something new every time. My art teacher told me when I left school that I had an illustrative style, so I went to study illustration as a degree. Craig Smith asked me if I would like to work with him on The Wonky Donkey. A first book for both of us...the rest is history! I was 35 when I illustrated The Wonky Donkey. I wrote and illustrated a book for my degree when I was 22 and it is in the pipeline to be released in the future, which is very exciting! You’re never too old or young to start. I have always loved creating and inventing characters, so it made sense to let them lead me into the world of publishing. I feel like a midwife helping characters be born into the world. I also love writing, so these are parts of me that have always been there. It is a pleasure and the greatest reward to share my creativity and have it be enjoyed. When I am creating characters, they start as more of a feeling. I pick up my pencil and watch as it shows me where it wants to go. I feel like I am ‘meeting’ them when they take shape on the page. It’s a very magical process. I love to create the initial sketches in cafes and public places before I go into the next stage, where I disappear into my studio with my music on loud and take my imagination by the hand and let it lead me deeper. I don't have to wear a special uniform to work. Drawing Wonky Donkey’s bottom while he farted in my direction (I had to wear a gas mask for that illustration and I nearly fell off my chair)! Sing, dance, draw in my journal, teach art classes and workshops, explore and create in every way. My partner Bruno and I also have a gallery where I show my original works and talk about the process of giving birth to characters and books. I love to sing, inspire people’s creativity and make people laugh, so in another life I might have chosen to be an opera-singing, paint-splashing comedian! An amazing artist called John Waterhouse—there is a very special feeling to his paintings. I believe in faeries and magic!